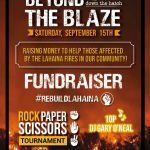 The Maui Cookie Lady recently made national news. 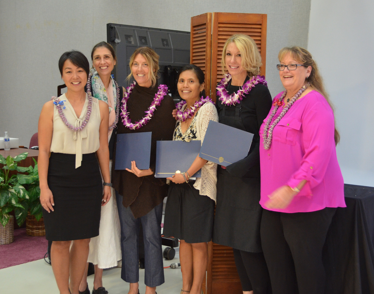 (Left to right) Ann Sakamoto, Central Pacific Bank; Elyse Ditzel, Wholefoods; Dawn Anderson; B Raw Bar; Michelle Valentin, Waii Foods; Mitzi Toro, Maui Cookie Lady; and Teena Rasmussen, County of Maui economic development director. Courtesy photo. Mitzi Toro, the owner of The Maui Cookie Lady, was recently featured on Good Morning America for her business start-up story. The news clip featured pictures of her creations, including actor Dwayne “The Rock” Johnson’s favorite, a 6 oz. cookie filled with an oreo and snickers candy. 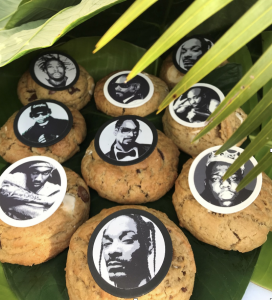 Actor and rapper Ludacris was also featured in the story talking about how Toroʻs cookies are his favorite, saying that he once rented a helicopter in Honolulu to fly to Maui just to meet Toro. Toro, a Maui school teacher, began baking cookies for the nurses at the Maui Memorial Medical Center, the facility that cared for her terminally-ill father. What began as simple thank you gifts quickly transformed into a cookie-making business. Toro said she is honored and thankful to her community for their support of her growing local business. Earlier this year, The Maui Cookie Lady became the first Maui Company to secure an account with GoldBely.com in New York City. Last summer The Maui Cookie Lady landed a floor spot at Saks Fifth Avenue Waikiki, where she sold out of her first shipment in a week. 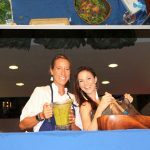 Toro said she encourages other food entrepreneurs to seek business advising from the Hawaiʻi Small Business Development Center and the Maui Food Innovation Center (MFIC) at the University of Hawaiʻi Maui College (UHMC). She was a graduate of the very first Maui Food Industry X-celerator Program cohort course at UHMC. “Mitzi is an inspiration to us all and a great role model for our expanding community of food entrepreneurs,” says MFIC Coordinator Chris Speere. The news clip can be seen on the Good Morning America website.